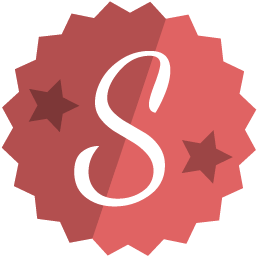 Sloweb is a non-profit association established to promote the responsible use of information technologies and devices, and of the web and Internet applications in general. 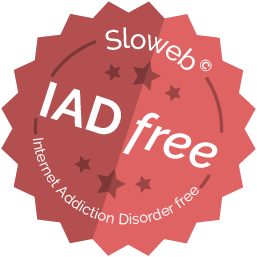 Sloweb activities include education, information and combating any improper public or private use of the internet and the web. Sloweb asserts that the web is an extraordinary vehicle for knowledge, memories and quality information sharing. Sloweb acknowledges the endless opportunities and the huge potential that digital technologies offer, also in facilitating the inclusion of challenged or disabled individuals. Sloweb recognizes that the use of information technologies involves a deep interference with the irrational, emotional and unconscious side of human nature. Besides the opportunities, risks and social phenomena exist that must be carefully assessed and in specific cases challenged. Sloweb is also committed to protecting human fundamental rights for the ecological use of personal digital data: reduce, select, protect, own and delete for ever, managing your own digital heritage. All the above is essential to make the web safer, free and beneficial for everyone. Spread Sloweb presence across the world. Support their customers to avoid spending excessive time on their applications, including through the use of specific platform innovative tools. Your main archive, your digital home. Easy, fun, safe and all yours. 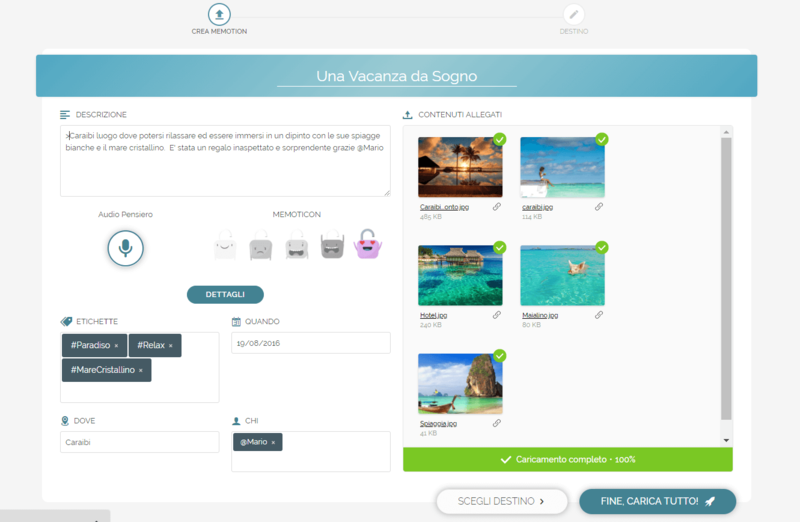 A quiet and protected place where your contents are organized into Folders and enhanced with tags, people, places and dates, ready to be turned into stories. 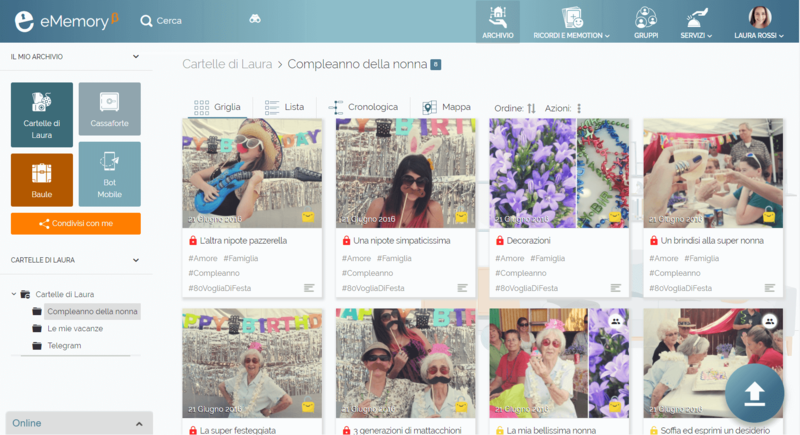 You can use tags to organize your memories. Protect and enhance your digital heritage. Memotions are collections of images, videos, texts, places and audio comments: a wonderful way to save and rediscover the moments from your past. You can keep them for yourself, or share and enhance them with your close ones. eMemory offers a safe and totally private space for families, organizations and companies, where you can save, share and pass on your stories, memories, documents. All members have their own personal space, and a dedicated device allows the whole group to manage the common heritage. Convert to digital files the most important pieces of your analog heritage: paper documents, old films, printings and slides. Enhance what you have gathered in time. Through eMemory you can contact our network of trusted professionals: the writer to find the best words for your story, the historian to retrace your own origins, notaries and lawyers for advice on legacies, both digital and physical. On social networks, retrieving personal contents is not such a simple and quick operation. With eMemory you can now easily import all your scattered contents. A private and secure place where you can protect your digital heritage. With our @bot_eMemory on Telegram, you can instantly upload and store contents, directly from your tablet or smartphone. Meaningful photos. Sudden thoughts. The sounds of your emotions. Through this function, you can select today's experience and turn it into the seed of future memory. All data on eMemory are encrypted. Those you value most, and for which you need an even higher level of privacy, are additionally protected through a two-stage authentication process and stored inside your digital Treasure Chest. All this to guarantee maximum security. We don't need to be able to access all our data in a fraction of a second, especially when those contents still need decluttering. eMemory offers you an ecological cold storage service: the selected data are stored in your Trunk. But they are still easy to access, with a little more patience. With our locks, each element is given a predetermined destiny: you can choose whether to share it and with whom, starting from any moment in the future, during or after your lifetime. The red lock protects the files that must be accessible only to you and deleted after your death. Thus, eMemory helps you leave behind clearer instructions regarding your digital legacy. You can request a physical copy of all the digital data you have gathered. Enjoy the possibility to keep them in tangible form at home. This service also allows you to request the delivery of a printed copy of both recent and old memories, e.g. work emails you chose to keep. the basic functions to start gathering, decluttering and protecting your memories, and to build your stories. Save your emotions in one click with our Bot. Are you a club, an organization or a company? Are you interested in making eMemory available to your members or workers? Contact us: we will send you an interesting offer tailored to your needs. 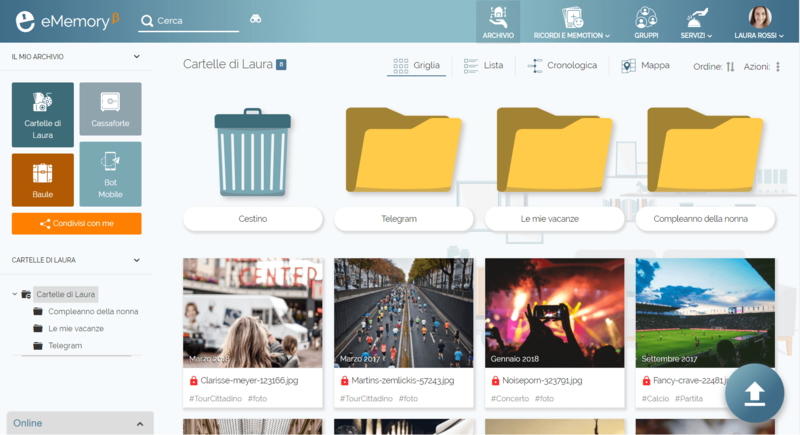 A Memotion is a collection of enhanced memories, created from your files (pictures, videos, audio files, documents) and enriched with added details. Its size can be up to 50MB. It is one of the most important things you can do on eMemory, using your own data or with the help of others. Our free Welcome plan includes 20 Memotions. Our Premium and Forever subscriptions include up to 600. What happens once I have used up all my Memotions? Obtaining more Memotions is easy. You can ask your friends, coworkers and relatives to share their memories with you, or you can purchase more Memotions. If you are a Premium or Forever user, you can save 50% on the price for more Memotions! If you need a particular amount of space, contact us: we will be happy to customize your eMemory subscription according to your wishes. What can I import from social media and cloud services? You can easily import on eMemory your best pictures from Facebook, important data saved on Dropbox, and all contents uploaded to the most common social networks and cloud services. What is the discount on eLegacy for my digital legacy? In eMemory basic legacy functions are limited to choosing a destiny for each of your files or Memotions. 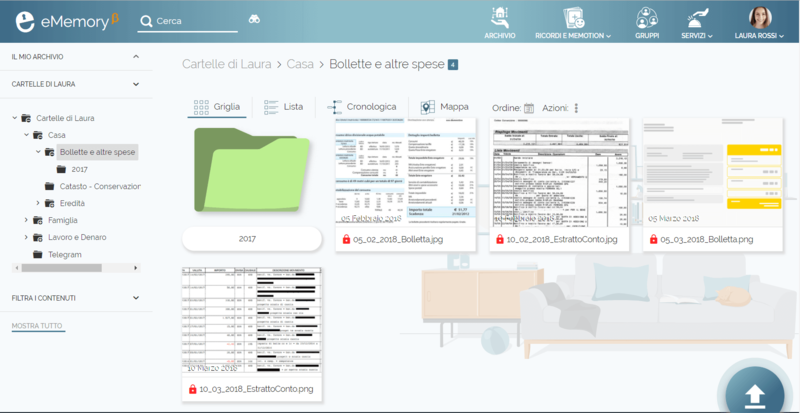 If you use eLegacy you can manage your digital legacy: how to leave to your beloved account and important info in case of illness, inability or death? By completing your inventory you can create a will and a mandate. You can also add funeral wills. Inside your eMemory house, the Trunk is a place where you can store a large amount of unorganized data. These are files you rarely need to access: you only wish to keep them in a safe place to retrieve them on occasion. Downloading them will take a few more minutes than usual. Exactly what happens when you need to retrieve something from an old trunk in your attic. This also has an eco-friendly side! Your digital Trunk is energy-efficient (it uses cold storage) and has a low impact on natural resources. In this way, you can reduce the space for everyday file management to what you really need to access quickly. Sometimes, even a small responsible choice can help you fight energy waste. What is the Treasure Chest? Inside your eMemory house, the Treasure Chest is a secure place where you can store your most valuable data. The encryption mechanisms that protect your Treasure Chest are even more sophisticated than those used for the other data on our platform. We also use a two-stage authentication process that will send a secret code to your smartphone to verify your identity as you request the access. Here you can safely store you bank account details, confidential data, sensitive data, financial data, passwords and much more. What kind of customer care can I request and when? Depending on your subscription, you can request customer care assistance via online chat, via phone or via remote software. We are available Mon-Fri from 9am to 6pm (CET). You can request assistance for uploading your files to eMemory, advice on which third-party services are best suited for you, general information on the World Wide Web, and much more. If you need assistance for better gathering, selecting and uploading your contents, eMemory offers you a network of qualified professionals. Our Telegram bot is a tool that lets you upload your memories on your eMemory profile anytime and anywhere, using Telegram chat to attach files. Uploading contents through our @bot_Telegram will feel like chatting with your digital home. All contents uploaded through our Bot will be saved in the Telegram folder on your eMemory profile. What are data encryption and safe deletion? When you upload a file to eMemory, its privacy will automatically be set to secret (red lock). This means that, when you are no longer here, it will be irreversibly deleted. To guarantee a safe deletion of files, your data are overwritten on our server and therefore made impossible to retrieve. Furthermore, all data you upload to eMemory are encrypted with standardized algorithms recognized as the most secure, and constantly updated. We also encrypt all communications to and from the eMemory server, to protect you from anyone who tries to intercept your internet traffic. Ensuring and protecting the privacy of your uploaded contents is our top priority. Third-party services are additional services offered by our network of trusted professionals, to help you enhance your memories and your digital heritage. Learn more about each service on its dedicated page..
What is physical data delivery? Some of you might not feel entirely comfortable just storing your personal data online. This is why we offer you the possibility to combine the benefits of a cloud platform with the sense of security given by keeping a physical copy of your whole digital heritage and the keys to access it. If you wish to receive once a year a physical copy of your data, you just need to purchase our dedicated service. We will deliver everything to you, saved on the most suitable and updated data carrier (pen drive, hard disk, SSD, etc). 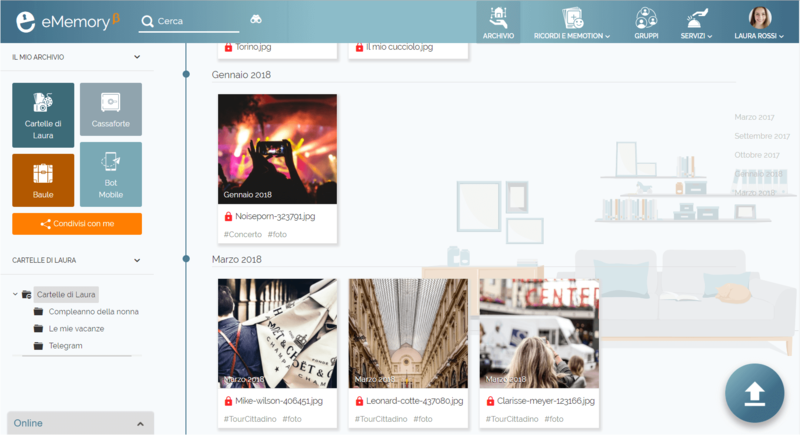 What are Map, Timeline and Graph views? Your memories, your stories and your contents can be viewed using different criteria. You can view a Timeline of your memories, a Memotion, or you can explore your memory map, the atlas of your memories. You can travel again through the years and places that witnessed your memories, your achievements, your stories. With our Graph you can move from one memory to another, retracing the connections between them. Discover their common details and unexpected linking elements. All together, you memories can really tell a unique story: your own. Start now to build up your memory!